Our brilliant, clever and fun Milestone Cards are the perfect photo props to celebrate your baby’s special moments. 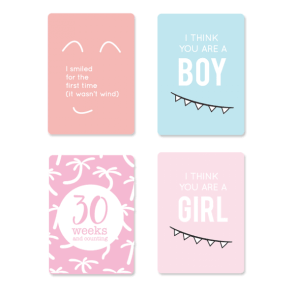 Our Milestone Cards have been designed with a bit of a quirky twist, to include the unique moments (pre and post baby) that every new parent goes through, for example, trying to predict bub’s gender or baby’s first non-wind-generated smile. The Milestone Flip Book provides another cool way to showcase your little one’s milestones, whether it be their 1st tooth or 5th birthday.